It’s the busiest time of the year, and I find myself running around like a headless chicken some days. So there isn’t much time to be making bento in the morning, especially after a late night out or something. I still like to bring along a healthy bento though, because I feel so much better after eating it than just grabbing a sandwich or a pizza or something for lunch. With my stash of staples or johbisai , whatever leftovers are on hand, and of course my hoard of frozen brown rice , I can throw together a little bento in about 5 minutes. (A little more time is needed for defrosting stuff, but you can do this while you’re running around getting ready.) 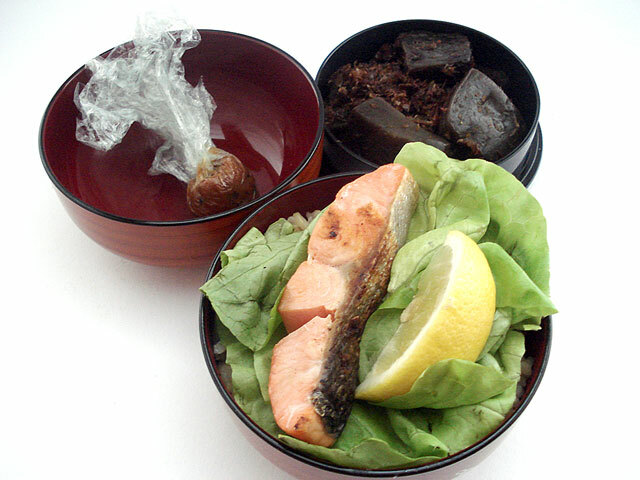 This bento uses a small piece of the salted salmon  I made a couple of weeks ago and stocked in the freezer, some sweet-and-salty konnyaku that was left over from dinner (recipe here ), and a few lettuce leaves. (If I had them I’d have used baby spinach leaves for that tiny bit more vitamin content.) I’ve also added an ‘instant’ miso soup ball . I love salmon in bento, because that pink color perks up the dullest bowl of rice. Green veggies do this also, or green herbs and sprinkles (green onion, parsley, chives, etc.) as does the old standby, the lemon wedge or slice. In the meantime, mix together the miso ball. 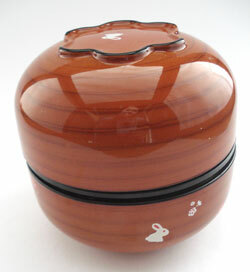 Put rice in your bento container. Top with lettuce or baby spinach leaves, lemon wedge, and salmon. Put the other leftovers in the other container (or to the other side of the bento box). Pack up and go! I haven’t made a timeline for this one, since it’s basically “heat or re-heat things, pack up and go”! And I need to go running around doing errands again.